This is a sponsored post written by me on behalf of M is for Monster – Preschool in a Box. All opinions are my own. Please view my disclosure. Teaching preschool at home for non-crafty moms can be intimidating. You read kid blogger network blogs and think to yourself, “I am not crafty enough to create this!” All the crafty moms sharing the beautifully photographed kids activities that make you wish you could put a great learning activity together for your child, but it would either take too long or look too “homemade”. I understand your frustration. 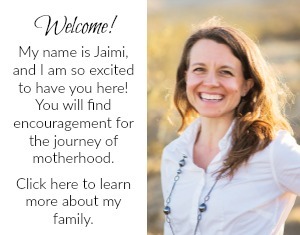 I have multiple children, a home to care for, a husband who I like spending time with, and errands to run. I am a crafty mom, but I stick with simple preschool activities. I want you to know, you can do it! 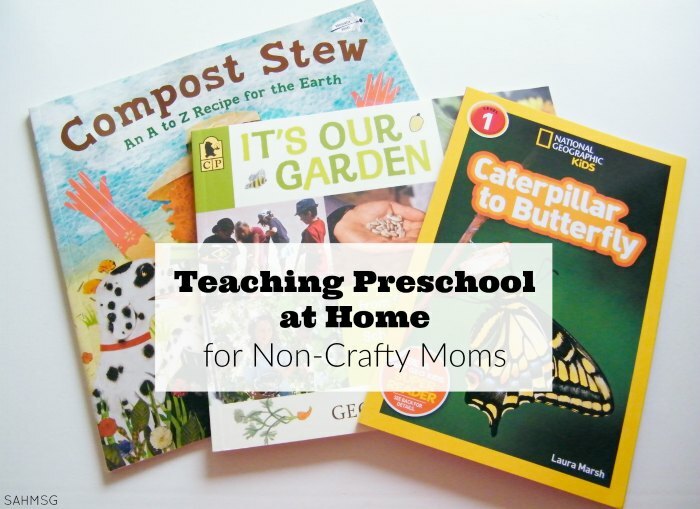 Teaching preschool at home for non-crafty moms is possible! I share simple activities all the time. They are quick to create, easy to recycle if they are used up or ripped, and they cost next to nothing. My kids get inventive and use their creativity when I step back and let them create. We need to be preparing our children for higher level learning. We can do it at home while they are young. This isn’t about making preschool as academically charged as elementary school, but it is about focusing on what you are teaching with the preschool activities you provide to your children…and keeping it simple! I like looking through the Dollar Aisle and Dollar Store when I have a moment-like when my husband is watching the kids and I get to run to Target on my own! (Mom-vacation!) It is great that there are inexpensive resources for our kids to learn basic concepts. Going one step further, I look for great ideas from fellow moms who have been home with their kids, They know that many days it is nice to have a table activity or two to get your child engaged in structured-but developmentally appropriate-learning. What if you are a non-crafty mom and don’t know how to create any learning activities for your preschool child? 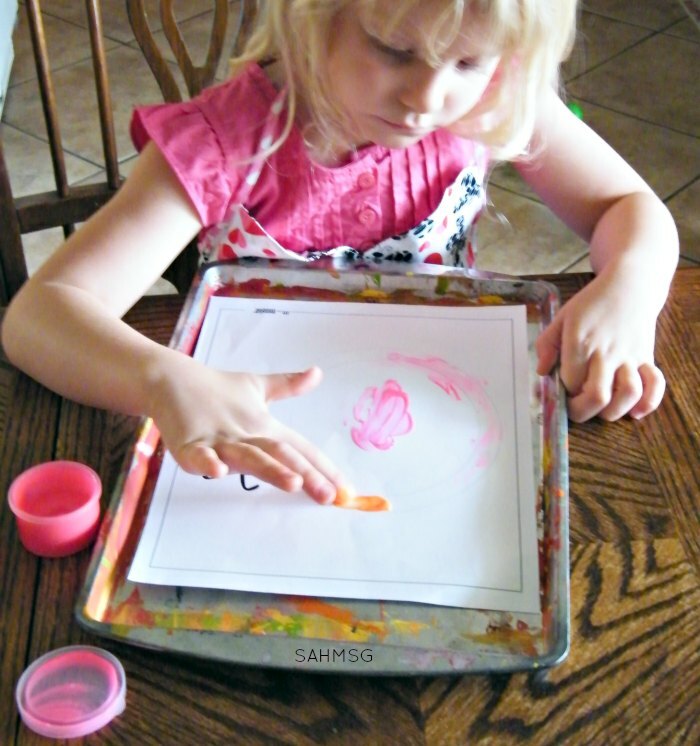 Try preschool activities at home like Preschool in a Box. When I buy pre-made preschool activity kits, I often look for ways to re-use the activities that come in the themed collection of activities. Most preschool kits are a bit pricey, but M is for Monster-Preschool in a Box is not. We recently tried M is for Monster Preschool in a Box themed kits. 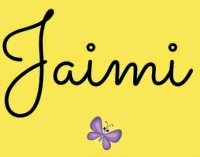 They are a great resource for teaching preschool at home for non-crafty moms. 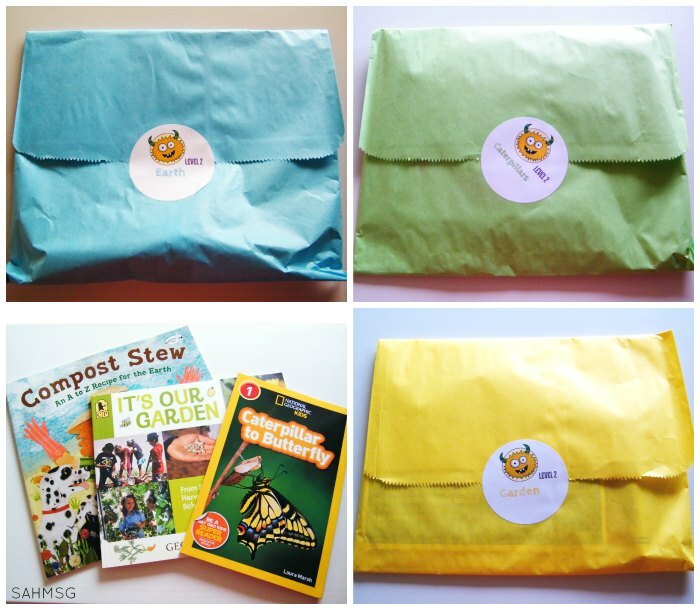 First off, we received 3 full-sized children’s books in the box and activities that coordinate with the themes of Earth Day, Caterpillars, and Gardening. Fun themes for Spring. 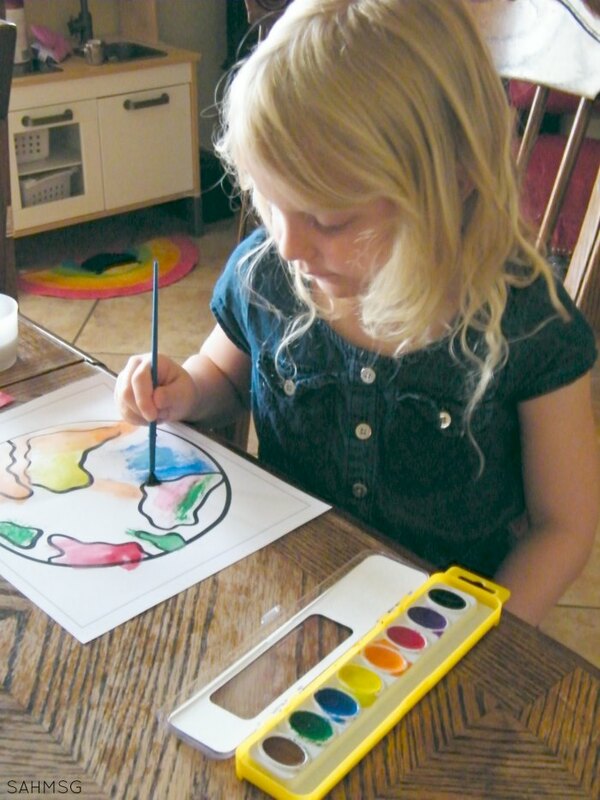 My preschooler was able to learn about the Earth with a globe painting project. The twins wanted to color too, so I just made two copies of the globe picture and they got to feel like they were working on the same learning activity as their big sister. Each activity has a simple card with how to set up the activities-you do not have to figure it all out on your own. Perfect for the non-crafty moms, the busy homeschool moms and the moms who are looking to supplement at home with learning activities when they have time. That is what is great about these kits. One will last you as long as you want since you can stretch out how often you try a new activity. Why not use them as rewards for good behavior if you have a system like that in place? My children act as if activities like this are rewards-they can’t wait to try them out! 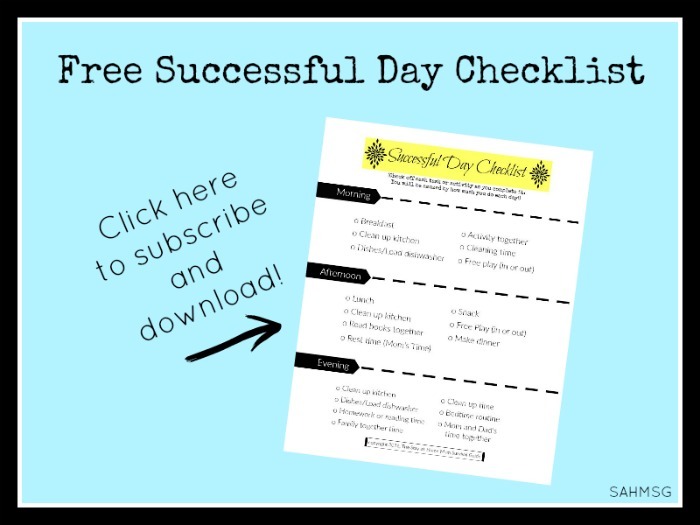 You certainly could complete all the activities in the kit in one day-that would be a full day of learning for a preschooler, but it can be nice to go slowly and let your child explore at their pace. 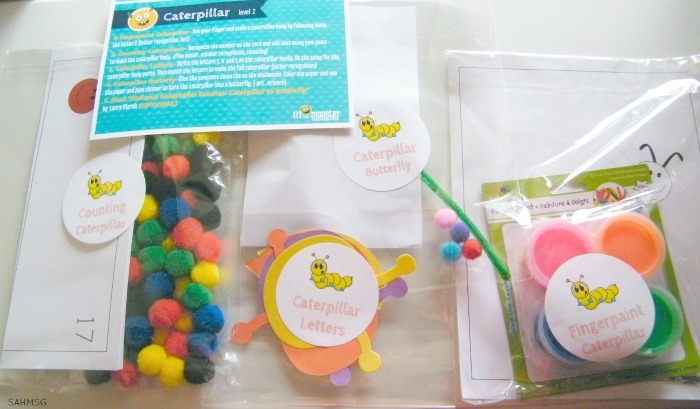 Each learning activity is developmentally appropriate for preschool and encourages children to learn through a variety of skills at one time-the fingerpainting letter C for Caterpillar activity encourages fine motor development, letter identification, and pre-reading skills. With this past year of homeschool preschool under my belt, I am really pleased with the growth that my daughter has made. It is so exciting to be the one teaching her! I know how she learns best and was able to turn that into fun learning activities. Try prepared activities like M is for Monster Preschool in a Box if you want to try teaching preschool at home, but count yourself as one of the non-crafty moms. M is for Monster Preschool in a Box is not expensive. You can save 20% off your first order when you use code: SAHMSG! When you want to have some options on a rainy day, or give a gift to a friend or family member that is more than another toy to get lost in the toy box, preschool learning activities have so much value. Most of the theme kits at M is for Monster cost less than $20, and you get to pick which theme you want to try with your child. Many kits are on sale for less than $10 right now! You pick the category based on your child’s skill level, so you won’t end up with a bunch of activities that are too advanced, or not challenging enough. My 5 year old who is not yet in kindergarten enjoyed ourCaterpillar, Garden and Earth Day kits. Remember, you can get 20% off your first order when you use code: SAHMSG. If you feel that you are a non-crafty mom who really struggles with knowing what activities to do with your child at home, check out the options for Preschool in a Box kits at M is for Monster. 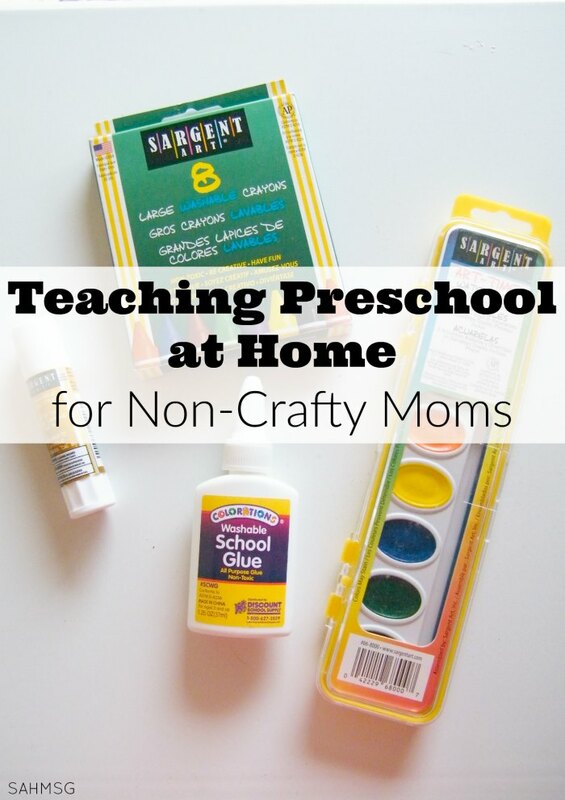 Teaching preschool at home for non-crafty moms is absolutely do-able! You can find many homeschool preschool resources here as well. Are you a non-crafty mom? Do you create activities at home or purchase inexpensive resources?